LEVEL CROSS, N.C. (September 19, 2018) – Petty’s Garage and Richard Petty Motorsports announced today it will auction off a Warrior Edition Ford F-150 truck to benefit longtime Petty partner, Paralyzed Veterans of America. World renowned car auction house, Barrett-Jackson, will auction the truck on Thursday, September 27 at the Mandalay Bay Resort and Casino in Las Vegas, Nevada. The Petty’s Garage Warrior Edition Ford F-150 is specifically built and designed for our nation’s heroes. 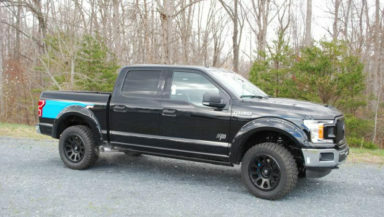 The custom truck is a premier F-150 built with a 750 horsepower supercharger. The truck also features 33-inch all-terrain tires, custom paint, interior, electric running boards and more. This F-150 will be branded with Petty’s Garage Warrior grill, hood, and windshield banner. It will be finished with a dash badge and Petty’s authentic autograph. The truck is provided by Petty’s Garage and Military AutoSource (MAS), a subsidiary of Overseas Military Sales Corporation. MAS has partnered with some of the leading names in vehicle customization and performance to craft vehicles that are not only unique, but also reflect the spirit of leadership and excellence that exemplify our military. Military AutoSource is committed to providing access, value, and benefits to those who serve, and the Warrior program is an extension of this mission. All the proceeds from the auction block will benefit and send critical funds to the Paralyzed Veterans of America (PVA). PVA, has been advocating for the needs of veterans with spinal cord injury or disease since 1946. The organization provides free programs and services such as adaptive sporting opportunities, job placement, VA benefits assistance and more, all free of charge to any veteran. The Petty family have been longtime supporters of the efforts of Paralyzed Veterans to support our nation’s veterans following catastrophic injury. For information on becoming a bidder, visit www.Barrett-Jackson.com/bid. Also, follow Barrett-Jackson on Facebook, Instagram, LinkedIn and Twitter for the latest news and information heading into the 2018 Las Vegas Auction. Founded in 2008, Petty’s Garage is a high performance speed shop owned by “The King” Richard Petty. Headquartered in Level Cross, North Carolina, Petty’s Garage occupies the legendary Petty facility that produced winning stock cars for more than 50 years. Petty’s Garage specializes in performance upgrades, restorations, luxury personal builds, custom builds, supercharged engines, paint and body, exhaust upgrades, brake systems, custom interiors, tires and wheels, custom fabricated projects, and corporate builds. If you can dream it, Petty’s Garage can build it. For more information on Petty’s Garage, please call 336-498-3745 or visit www.pettys-garage.com. Paralyzed Veterans of America is the only congressionally chartered veterans service organization dedicated solely for the benefit and representation of veterans with spinal cord injuryordisease. For 70 years, Paralyzed Veterans has ensured that veterans have received thebenefits earned through their service to our nation; monitored their care in VA spinal cord injury units, fundedresearch and education in the search for a cure and improved care for individuals with paralysis. As a partner for life, Paralyzed Veterans also develops training and career services, works to ensureaccessibility in public buildings and spaces, provides health and rehabilitation opportunities through sports and recreation and advocates for veterans and all people with disabilities. With more than 70 offices and 34chapters, Paralyzed Veterans serves veterans, their families and theircaregivers in all 50 states, the District of Columbia and Puerto Rico. You can learn more about Paralyzed Veterans at http://www.pva.org/. Military AutoSource (MAS) is a subsidiary of Overseas Military Sales Corporation (OMSC) based in Woodbury, New York. For over 55 years, MAS has served the military community by providing U.S. specification automobiles and motorcycles to active duty military, civilian, DOD employees and the diplomatic community stationed on U.S. installations outside the United States. The on-base division of Military AutoSource is authorized by The Exchange (AAFES) and Navy Exchange (NEXCOM) and maintains operations with more than 70 locations in over 20 countries. You can learn more about MAS at http://www.militaryautosource.com.